Week 9 “ November 28th – December 4th” is the beginning of what we label the late season. This week should be more about preparation than actual hunting. Bucks are turning their attention off of does, and back onto food. This switch has them often times coming back to their early season ranges. The range will be determined by what late season food sources are available and it is up to you to determine where that might actually be. For preparation and to discover a buck worth hunting…this week’s topic is trail camera tips for the late season. This week starts a period that can be easily categorized as the late season, and just as we did for the period of the rut during early November we will do for this period. During the beginning of the rut we discussed trail camera tips and settings for the rut, and for the beginning of the late season we will also reveal trail camera tips. Cold temps force deer to hit food early in the afternoons, which can bring mature bucks out in daylight. This daily pattern once the cold temperatures arrive and stay can become one of the best opportunities of the year at a mature buck. But not without the help of trail cameras. This is the week to change up your trail camera strategy, setup new camera spots and adjust the settings from rut focused to late season focused. With food being the focus our trail camera tips take the form of what they were during the early season…time-lapse being a key feature this week. The big late season food sources that could be available are standing corn, standing beans, brassicas, or a cover crop of rye or wheat on the crop fields. On this property we were lucky enough to have a farmer plant a cover of rye… this will be our focus. The first and most dependable is the time-lapse function on a trail camera. 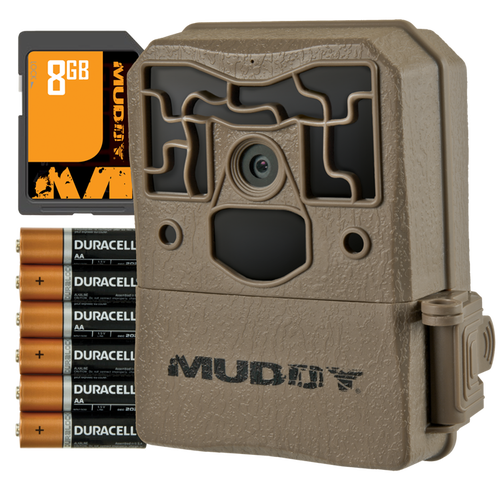 For this function you want to have a camera with great quality, the Muddy Pro Cam 12s have 12-megapixel images so they work great for the late season. To hang the camera you simply hang the camera where it can clearly see the whole field. You want a good vantage and one very important tip is not facing the setting sun. For the settings on the camera you want to have it on the last hour to 2 hours of daylight and a photo every 30 seconds to a minute. Make sure you have a big memory card, I prefer a 16gb for my cameras. By doing this, it allows you to survey how many, and which deer are using the food source during legal hunting times, and it also can help you pinpoint mature bucks patterns…and where to hang the second camera for late season intel! With this winter rye taking the role of the main food source, we are clearly seeing direct traffic, By identifying the bedding area and looking at the topography, we can clearly see where the most traffic is coming from into and out of the field. By setting a game camera on these late season funnels, and using the same settings we did during the rut, a long video mode, or 6-8 photo burst with a short delay. We can take inventory of deer filtering out into the plot and potentially reveal an opportunity to harvest a buck in one of the pinch points. This also gives us pictures during the night, which the time-lapse function does not, potentially revealing just after dark movements telling us that we should move towards the bedding area to catch a buck during daylight. By following these trail camera tips for the late season this week, you can start gathering intel on a buck’s late season pattern before the temps get cold. Stay out of the food sources until those cold temps hit, and you have enough intel to make a move on a buck. As we progress through the late season remember these tips, and be careful not to over pressure your food source.